Plus, take an additional 10% off sitewide! Strike-through prices not eligible. Use code MOTHER at checkout. The exterior is finished in premium leatherette, assembled with uncompromising precision and attention to detail. The playing surface is an ultra fine padded felt, offering a luxurious glide for the checkers that will delight your senses. The checkers are a hefty 1.25" diameter and 3/8" thick. Best of all, the checkers fit perfectly in the home board, with minimal gap when side by side. There's more! You'll also appreciate the ergonomic oval dice cups, with smooth felt lining (to reduce noise) and with tournament grade trip lips to ensure a fair dice roll each and every time. Each set also comes with a large 1" doubling cube and 1/2" high gloss black and white dice. These are all characteristics normally found only in much pricier backgammon sets. That is, until now. Silverman & Co. premium backgammon sets are by far, the best combination of high quality and unbeatable value that you will find anywhere. 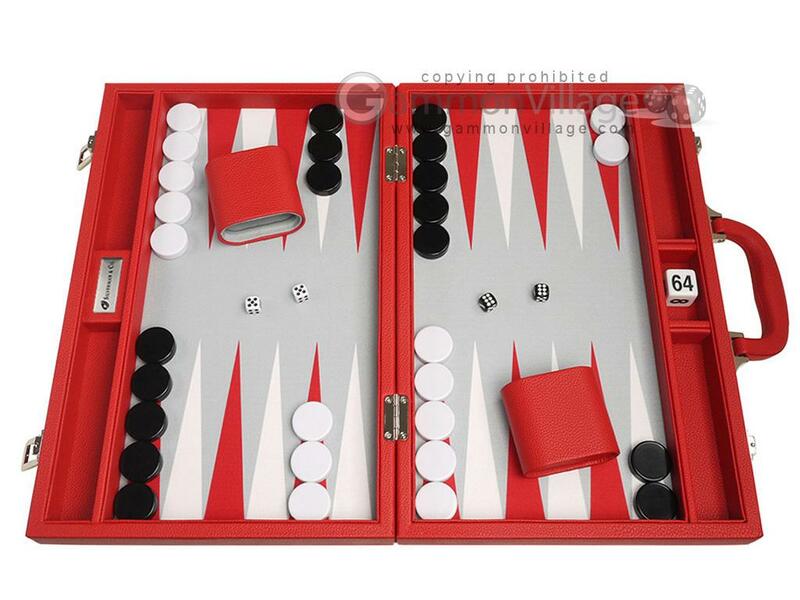 Available exclusively from GammonVillage, we unreservedly give these backgammon boards our highest recommendation. Available in 3 sizes: 13" (travel), 16" (medium) and 19" (large). Page P4881 Copyright © 1999-2019 GammonVillage Inc., USA. All rights reserved.